What Happens When an Egg Cracks While Hard Boiling? Fresh eggs are harder to peel than older ones. 1 Can You Eat Hard-Boiled Eggs Even Though the Shells Are Cracked? Making the perfect hard-boiled egg seems like it should be a breeze, but it can be surprisingly difficult. Eggs often crack during boiling or develop off colors and odors. Cracks in the eggs aren't the end of the world, but they do shorten shelf life and ruin an egg's appearance. Cracks can usually be prevented by altering your cooking techniques. Eggs sometimes crack during boiling for a variety of reasons. The main reason is that they were boiled at such intensity that they collided with each other or the pan, resulting in cracks. Eggs from organically fed, free-range chickens tend to have harder shells than conventional eggs, so they're less likely to crack. Another reason eggs sometimes crack is they're cooked too quickly. Gases build up in the egg and can't escape, causing the shells to crack. The first thing you'll notice if an egg cracks while it's boiling is long bits of white membrane streaming from the egg. If the crack becomes larger, more pieces of egg whites will emerge from the egg. The egg itself may be watery if the crack is large enough to allow water to enter the egg as it cooks. A cracked egg is perfectly edible, but it might not look as aesthetically pleasing as an uncracked one. It also won't last as long because bacteria can enter the cracks. 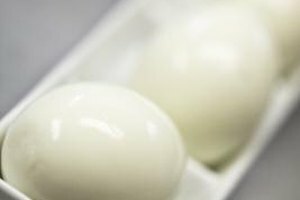 A cracked boiled egg might not be the best choice for dying, but you can still use it in the kitchen. Peel the cracked egg and cut off any bubbles or bumps. 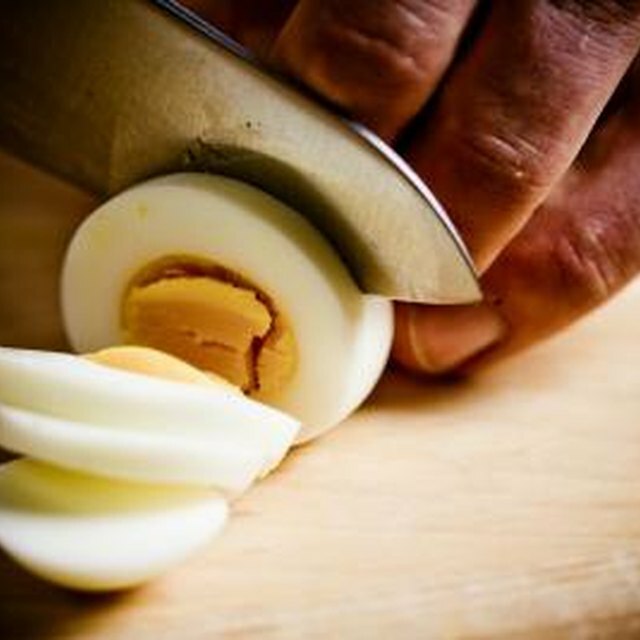 Slice the egg and use it in egg salad or to top a spinach or chef salad. Try the old nursery dish, creamed eggs on toast, which is simply diced, hard-boiled eggs heated with a canned cream soup and served over toast. Whether cracked or not, hard-boiled eggs spoil more quickly than uncooked eggs because the protective coating that covers the shell is removed during boiling. Refrigerate all hard-boiled eggs within two hours and use them within one week. To prevent cracked eggs, try the following tricks. Start with eggs that are neither extremely fresh or old. Using organic eggs isn't necessary, but it can help. Place the eggs in a pan and cover them with cold water. Add a bit of salt, which causes the whites to cook faster. This strategy helps reduce cracking and if an egg does crack, the whites won't run out. Bring the eggs to nearly boiling. Cover them and remove them from the heat. Let them sit for 12 to 20 minutes, depending on the size of the eggs and your altitude. Eggs need to cook a bit longer at high altitude. Then, drain the water and replace it with ice cold water to stop the cooking process. Getting the timing right takes a little practice. Too little time yields runny yolks, while too much time yields rubbery egg whites and green yolks. Exploratorium: Do You Know How to Hard Cook an Egg? Should I Pierce Eggs Before Boiling?